Meditation is something we do: it's an act of quieting that very loud voice in our heads insisting we attend to everything (from FB to spreadsheets) but find stillness. Mindfulness is a way to be: it wraps all that meditation-induced peace around our dailyness, allowing us to remember our Joy in the moment-by-moment of our lives (which, coincidentally, makes us better family members and employees). In classes, we practice both aspects, and let them beautifully reinforce each other. Fortunately, it's easier than it seems! You are all welcome to join our virtual meditation group from wherever you may be on Wednesdays from 11:30 am to noon, CST. We call it SOLV for Sending Out Loving Vibrations. So, get comfy in your own space, and SOLV with us! Have a seat (near a co-worker): find your way to happiness at work by working at happiness. 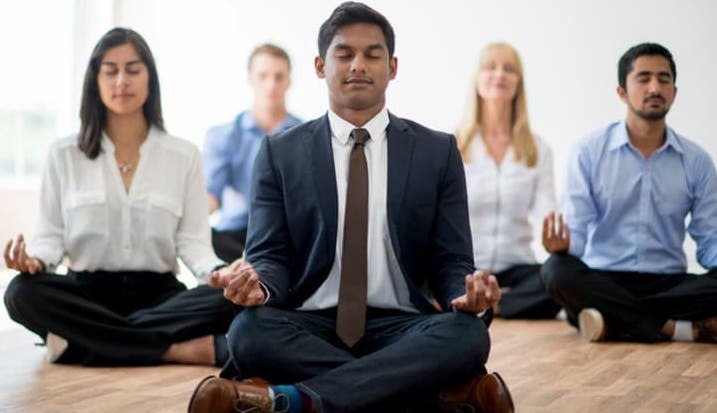 Practicing mindfulness at work is an amazing (well-documented!) technique to reduce stress levels, increase productivity, decrease absenteeism, and more. Oh, and it definitely makes work more fun! We all need tools for stress at the office. Kelly presents with such happiness, it's easy to put those tools to use. Her energy inspires! -J.L. Unless you wake up like this every morning, you could probably benefit from a mindfulness class! You can't always make a class, and practicing solo, well, sometimes we all need a hand! If so, a few private sessions might be just the ticket to jump-start you back to joy. As a crazy-busy attorney, I can breathe and focus incredibly well after phone sessions with Kelly (who is a total rockstar!) -M.T. Group classes are uplifting: you'll be surprised by what a group's energy can teach you. I love teaching group classes, and some of them are open to the public. Classes range from 4 to 8 weeks (you'll even love the homework!) Check the schedule for a class near you. Kelly has a masterful way of presenting meditation principles...it is a joy to take any class with her. -D.M.